Sydney’s Best Pho Search is Launched! Vote NOW! If you have a favourite Pho restaurant in Sydney, now’s the time to vote for them! Woohoo! Let the games begin, it would be interesting to see what people have to say 🙂 What's your favourite? yes it would be interesting.. the results even on the first day is v interesting… can't tell you my favourite right now.. that would be influencing people! 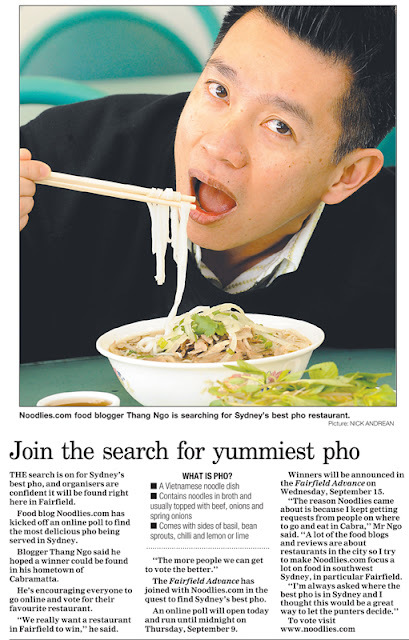 Can you spread the word amongst your networks too… would be good to find out Sydney's Best Pho! I wish I could have a well-informed opinion here, but the area of Sydney where I live and work just doesn't have enough pho for me to even compare! =( Best of luck with your quest, though! Thanks for the good wishes mademoiselle! I love your blog, too. There are too many PHO restaurants in Sydney. It is hard to pick up the best PHO. I have been in Thang Long, Pasteur in Bansktown. They serve with big bowls. They are ok but Pho Thang Long was served not hot enough. Yep, it's very subjective, Pho. Right now, there seems to be 3 clear leaders in the race for Sydney's Best Pho… it's getting exciting.